Arrival in Malaga. Your Spanish experience starts here! Step off your cruise vessel and into the port. Already, you're feeling a tad hungry. But what are you going to eat? Why, tapas of course! Tapas is a concept that completely embodies the culture, and you're certain to see plenty of it consumed as you wander around town. Whether you're in Barcelona, Rosas, Mallorca, Lloret de Mar or Valencia, eating Spanish style is sure to be an enjoyable experience. But if you're worried about feeling lost at sea among the flurry of fingers, then never fear. Here at Iglu, we have a guide for everything and tapas is no exception. 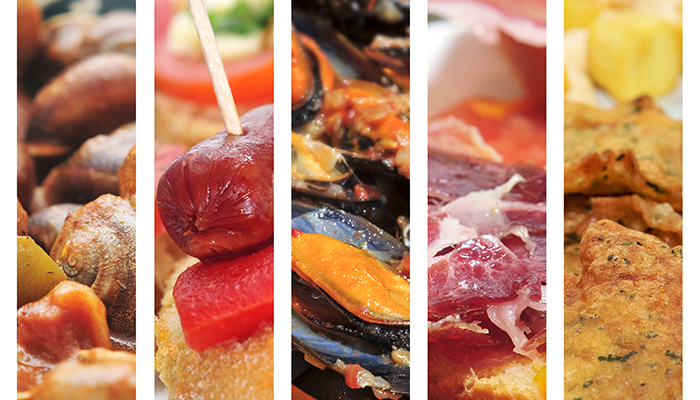 It's important to remember that tapas is a method of eating food rather than a specific dish. Small plates containing a specific type of food are served up, and these can vary wildly. A typical tapas menu might contain anything from filled peppers and olives to swordfish and baby octopus to dried ham and croquettes. There isn't really a limit on what can be put on a small plate. Of course, the very point of serving food this way is that you don't need etiquette. Tapas is traditionally served among friends, with everyone taking as much as they want of everything while the conversation (and wine) flows freely. It's a social grease, with businessmen even choosing to take potential customers out to lunch in order to create good banter and a social atmosphere - it's highly conducive to securing a deal. Keep this no-rules mentality in mind when ordering. Many of the best tapas dishes are served in bars where your only menu might be the huge glass display case, beneath which all the food is laid out. Don't be afraid to squeeze between the locals, calling to the barman to attract his attention. However, never try and pay for your meal before you've finished eating it. This is a surefire way to draw attention to yourself as a tourist. Bar staff and waiters remember orders for hordes of people, so once you've finished, simply ask for 'la cuenta' and wait for the receipt to be handed to you. Now we come to the fun part - what types of tapas to try! You are likely to be greeted with a plethora of choice when you take a look at that menu, and there are no hard and fast rules about what to have. Choose anything that takes your fancy, but it's always fun to have a variety. Two must-try dishes are croquettes and patatas bravas. The first contains a filling - usually ham, fish, chicken, spinach, potato or a mix - that is coated in breadcrumbs and fried in oil. They are extremely common, often come in a variety of sizes and taste delicious. Patatas bravas, meanwhile, is also popular across all of Spain. These chopped potatoes come smothered with a tangy, spicy sauce and garlic mayonnaise. If you're feeling brave, you might like to order pimientos de Padrón. These small green peppers are the equivalent of playing Russian Roulette with your food. Most are quite mild, but occasionally you'll stumble across one with a bit more fire, so it's important not to get complacent! Calamari, baby octopus, swordfish, oysters, mussels and prawns are common types of seafood tapas that you can enjoy near the coast. A word you're likely to see and hear a lot in Catalonia is allioli, which is simply a condiment containing garlic, oil and sometimes mayonnaise. It's often served with grilled potatoes, fish, meat or vegetables. One final dish to watch out for is pinchos. These small kebabs might be laden with meat, fish or vegetables and they often have entire bars dedicated to them. When eating at these bars, the etiquette is a little different. Ask the waiter for a plate before helping yourself to whichever pinchos take your fancy. You'll need to keep all of the little cocktail sticks as these will later be used to calculate your bill. "Para beber? ", your waiter will say, while looking expectant. Good question - what should you drink with tapas? Like the rest of the concept, there isn't really a hard and fast answer. However, if you're watching the locals, you'll notice the lighter accompaniments tend to be quite popular. Vermouth is a common one, as is Basque cider. A light white wine is generally considered a good choice, but avoid the heavy reds since these have a tendency to overwhelm the taste buds. In Catalonia, Cava is particularly common. However, while it's good to keep all of this in mind, don't forget that there aren't really rules to tapas and you can enjoy the experience however you like. If the food is going into your mouth and you're liking how it tastes, you're probably doing it correctly.